The Republic of Kazakhstan held a rotating seat at the United Nations Security Council (UNSC) in 2017-2018. It was the first time that a Central Asian nation was selected for the position. As President Nursultan Nazarbayev’s sudden resignation on March 19 draws attention to the country, along with the move to rename the capital, Astana, to Nursultan, it’s an ideal time to discuss what Kazakhstan accomplished, or not, in the UNSC. Kazakhstan’s tenure in the UNSC lasted from January 1, 2017 to December 31, 2018. The country was elected in 2016 to represent Asia, defeating Thailand for the spot. Kazakhstan obtained 113 votes and Thailand received 77 during the first round of voting; in the second round, Kazakhstan obtained 138 votes. 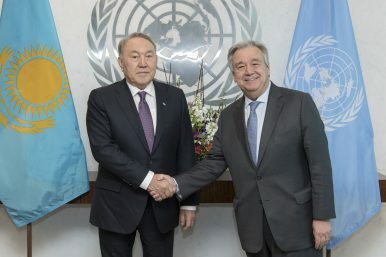 As part of its tenure in the UNSC, Kazakhstan was president of the Security Council in January 2018, which was marked by a trip by President Nazarbayev to New York. Kazakhstan was succeeded by Indonesia when its term ended. “I think being a non-permanent member of the Security Council, with this pattern of Kazakhstan’s’ international engagement and diplomacy, is very much along the lines of President Nursultan Nazarbayev’s policy of multi-vector diplomacy,” Ariel Cohen said of Kazakhstan’s achievement. But what did Astana accomplish while in the UNSC? While it was the UNSC’s pro-tempore president, Kazakhstan oversaw a special meeting held on January 18, 2018 on the non-proliferation of weapons of mass destruction (WMD) and confidence-building measures. UN Secretary General Antonio Guterres attended said meeting and declared that “Kazakhstan has a proud tradition of support for a world free of weapons of mass destruction, and for the global non-proliferation regime…Kazakhstan’s contributions include rejecting the possession of nuclear weapons and founding the International Day against Nuclear Tests.” The Central Asian state voluntarily gave up its Soviet-era stockpile of nuclear weapons shortly after gaining independence from the dissolving Soviet Union in 1991. The country held a meeting on January 19, 2018, that discussed regional partnerships in Central Asia. The event included a discussion about how the situation in Afghanistan “should be looked at from a security and development perspective, as those issues [go] hand-in-hand in the creation of a sustainable peace in that country.” Then, an open debate on January 25 addressed issues such as the Middle East conflict, the peace process in Colombia, the conflict in Syria, and the status of UN peacekeeping operations in Africa. Ambassador Kairat Umarov of Kazakhstan, then-Security Council President, led a UNSC delegation to Kabul, from January 13-15, 2018. The trip, which included meetings with President Ashraf Ghani of Afghanistan, occurred ahead of the February 2018 Kabul Process meeting. “The delegation also met with the leadership of the UN Assistance Mission in Afghanistan (UNAMA) and the Resolute Support Mission of the North Atlantic Treaty Organization (NATO),” a UN press release explains. Finally, Kazakhstan proclaimed its support for UNSC reform, namely the expansion of the body’s permanent members, an idea that has been widely discussed, but has yet to be carried out. The permanent representative of Kazakhstan to the UN provided a summary of the UNSC’s activities during January 2018 in August of that year. Kazakhstan’s good intentions and ambitious agenda while in the UNSC were hindered by what appears to be insurmountable global geopolitics. For example, the aforementioned meetings and declarations in favor of eliminating WMDs notwithstanding, the United States and Russia have announced their intention to withdraw from the INF, which will negatively affect arms control for years. Moreover, the February 2019 summit between U.S. and North Korean leaders to discuss the Asian nation’s nuclear program has been generally regarded as a failure, while the Iran nuclear deal is arguably defunct because of the United States. Meanwhile, violence in Afghanistan continues. One positive outcome of Kazakhstan’s tenure in the UNSC was that it likely prompted Kazakhstan to have a more active role in UN peacekeeping operations. A company of Kazakhstani peacekeepers was deployed for the first time to the UN mission in Lebanon, UNIFIL, last October, and a new contingent is scheduled to arrive in April. The United Nations is a complicated organization, where good will and idealism clash with realism and national interests, and also incompetence. Kazakhstan achieved what no other Central Asian country has managed to so far: a seat in the UNSC. But in spite of its good intentions, Kazakhstan’s achievements were marginal. As Nazarbayev was an ardent supporter of Kazakhstan’s ambitious foreign policy, including the country’s participation in UN peacekeeping operations, it will be important to monitor whether interim President Kassym-Jomart Tokayev and the next head of state follow the Nazarbayev’s vision. Kazakh President Nursultan Nazarbayev ResignsKazakhstan Wins Seat on UN Security CouncilKazakhstan’s Top Party Picks President, Meanwhile the Youth Debate the FutureKazakhstan’s BTA Bank Targets Felix Sater in LawsuitIs This the End of the Nazarbayev Era?